We’re all trying to get the most out of these sunny Vancouver days—before we’re plunged back into a winter straight out of George RR Martin’s sick and twisted imagination. But all those patio drinks, outdoor concerts, and trips to Playland can really take a toll on the bank account. While it’s important to treat yo’self as the wonderful and deserving person that you are, sometimes you just don’t have enough dough to do all of the things you want to do. But don’t worry, you can still enjoy all of that sweet summer sunshine without breaking the bank. So, here are a few suggestions for things you can do in Van City this summer if you’re broke. Do you keep telling yourself that you should really make it out to the Vancouver Art Gallery sometime, but just can’t scrounge up the entrance fee? Well, you no longer have an excuse to remain so uncultured, as there are many free self guided tours of Vancouver’s public art available. All you have to do is look up the audio file to have a tour guide direct—and educate—you around all those cool creations. Seriously, this one may seem obvious, but guaranteed there is a trail out there that you have yet to conquer. We live in BC after all. So get those boots on, get out that door, and make the most of the summer weather before the mountains are covered in snow again (though in some cases, they still are). This is a list of free things to do in Vancouver, not secret things to do in Vancouver. What’s more free than getting nearly—or totally—naked and basking in the sunshine? 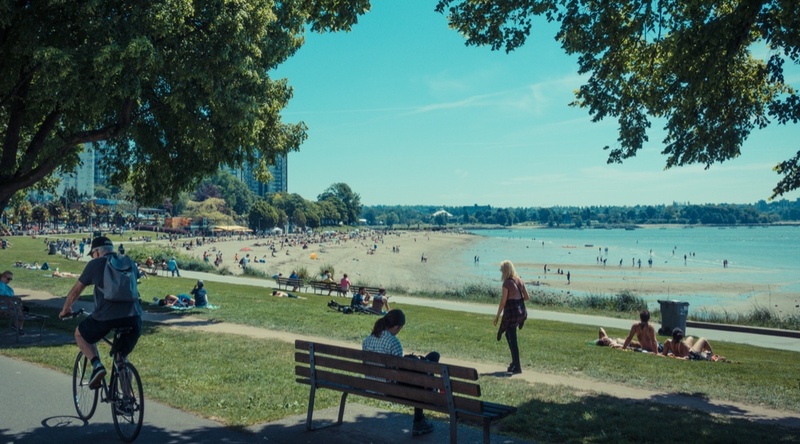 Vancouver has a crazy amount of beaches to go to, so odds are you’ll be able to find something new. Save that $30 admission fee for mini donuts, because the PNE is offering free admission from 11 am to 1 pm on August 22 and 29. Just make sure to get there early; “FREE” usually draws a like-minded crowd, and waiting in line costs your most precious commodity: time. It’s like normal golf, but without the $70+ green fees. Also, it’s with a frisbee instead. You’ll need to supply your own disc, however, so this one may end up costing a whopping $5. Direct your complaints to the comments below, please and thank you. A great way to stay in the shade on a sunny day, climbing the infamous Cambie climbing tree is something of a rite of passage in Vancouver. Make it all the way to the top and reward yourself with a rest in the hammock some brave climber placed there. Climb at your own risk, of course. Forget spending the $43 that the Capilano Suspension Bridge charges, take your fear of heights and wobbly surfaces over to Lynn Canyon instead. The park is the perfect place for a long walk, a relaxing picnic, and gazing over the bridge into the falls below. Don’t have a ball? Don’t worry about it. No net? No sweat. All you need to do to play a nice game of beach volleyball in Vancouver is ask. Usually the players will let you join them for a game or two, unless they’re in the middle of a super serious tournament—and in that case, you get to watch some great volleyball! You’re going to have to do some work to earn this “free” burger, and the work is eating the burger itself. The Two Parrots Two Pounder Burger is a behemoth of meat, cheese, buns, and toppings. But if you finish the whole thing in an hour (no bathroom breaks!) the burger is paid for by the restaurant and you get your picture put on their wall of champions. There’s no better way to avoid spending your hard earned money than by placing yourself in an area where there isn’t anything to buy: namely, the woods. Most campsites charge a fee to stay overnight, but there are a few that a free to stay at in the area. Try Jones Lake in Chilliwack, or Granite Falls on the Indian Arm. Or walk around it, with everyone else. But you’d be amazed at how many often-secluded trails there are to discover within the park itself. There are many streams, a few lakes, and a great array of wildlife waiting to be seen. Sure there’s sunshine and ocean breeze on the seawall, but there’s also just So. Many. Tourists. Maybe you don’t have a DSLR, but you’ve got a phone, and it’s 2017… that thing must have a camera on it. Vancouver is one of the most photogenic cities in the world, So spend a day trying to find the angles that no one else has captured, get creative, and fill up that camera roll with fire Instagram photos to post down the line. You’ll be amazed where your feet will take you when all you’re looking for is an interesting shot.